Editorial: Christians and counselling - Do you think Christians need counselling, asks Jacob Ninan. A different kind of healing - The only requirement expected of man is that he accepts that great salvation so freely offered, teaches K. P. Luke Vydhian. Why this delay? - We should be looking for the new heaven and the new earth that God creates and over which Christ will reign, encourages P. Abraham. The King has come - Christ has come to make His glory revealed through His people, reminds Francis Sunderaraj. The disciple and a valley too deep to cross - God does not force salvation on anybody, man must desire to receive it as a free gift, stresses Imanuel G. Christian. Vermicelli paayasam - If the Master has allowed affliction, He has a purpose behind it, states Lily Abraham. Believe in miracles and expect miracles - Peter S. C. Pothan stresses the importance of miracles and encourages everyone to believe in them. 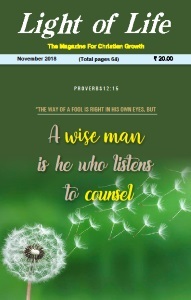 Master your money or it will enslave you - Samson Gandhi looks at how we may use the financial blessings for exerting godly influence in our nation. The making of Peter the disciple - Let us continue to follow after Jesus, not losing hope, encouragesSandeep Poonen.